NUDURA is committed to leading the industry in product innovation. NUDURA’s research and development group is dedicated to providing products that make the building construction faster and easier, resulting in buildings that are stronger, more durable, and energy efficient. 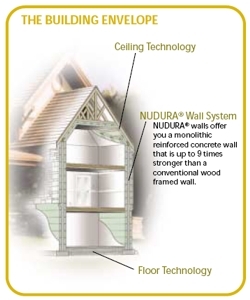 Designed and developed by those who have used ICF’s extensively, NUDURA provides many advantages over the competition. Product Features – NUDURA leads the industry in product feature benefits, including having the largest standard form on the market, four-way reversible interlock, and the industry’s only patented locking hinged folding web. Product Variety – NUDURA has the industry’s largest variety of forms. This includes standard cores sizes of 4”, 6”, 8”, 10”, 12”, and the ability to create even larger core sizes on site. In addition to this, NUDURA’s product line includes unassembled forms, brick ledge forms, taper top, radius forms, t-wall forms, and many accessories. Customer Support – NUDURA provides Customer Support to the end user unequaled in the ICF industry. By working with local distributers, NUDURA users receive timely, local support. Product Supply – NUDURA stocks an extensive quantity of material in their two state of the art manufacturing facilities. This virtually eliminates any lead time in shipping material. Industry Leadership – By aggressively pursuing code approvals, NUDURA has become one of the industry leaders in all commercial and residential construction, and their Technical support team is one of the best in the industry. As a homeowner, or someone looking at building their first home, you can rest assured that using NUDURA will provide the foundation for a successful project.